Walking and jogging are both effective for burning calories and improving your cardiovascular health. 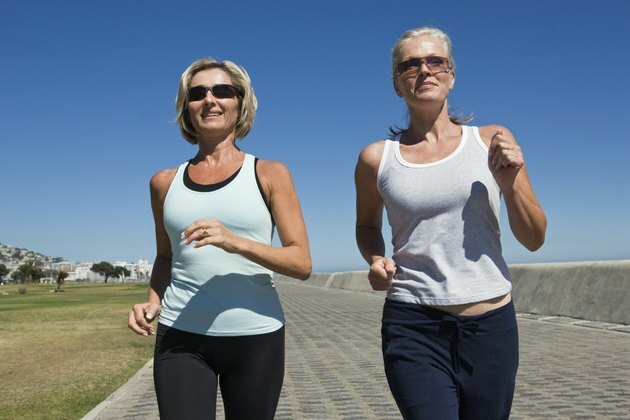 When it comes to burning fat, many people assume that jogging is more effective than walking. But walking can be just as effective as jogging if you walk for a long-enough duration at a high-enough intensity. A 2004 study published in "Medicine and Science in Sports and Exercise" found that running required more energy than walking over a distance of 1,600 meters. But the running speed in this study was twice that of the walking speed. Another study published in the Journal of "Sports Medicine and Physical Fitness" found that during walking and jogging at the same speed over the same distance, walkers burned as much or more energy than joggers. An article published in "The Physician and Sports Medicine" noted that moderate-intensity activity such as easy jogging has a higher rate of fat oxidation than low-intensity walking. But walking at higher intensities may result in similar fat-burning activity. An article published in the "American Journal of Clinical Nutrition" found that endurance exercise performed at 65 percent of maximal oxygen consumption recruited nearly twice as much fat as activities performed at 25 percent of maximal oxygen consumption. The time you spend walking versus jogging will influence how much fat you burn, particularly if you jog faster than you walk. A 2013 study of 33,000 runners and 15,000 walkers by the American Heart Association found that runners tend to expend twice as much energy as walkers, probably because they cover more distance in the same amount of time. However, if you are more likely to maintain a walking program, walking is probably a better choice for burning fat over the long run.